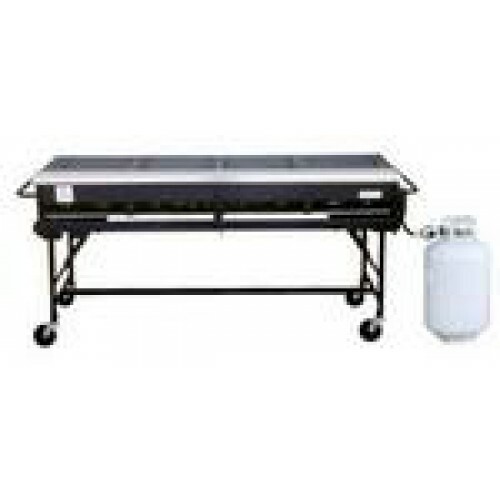 Grill - Gas Propane 18"x68"
SUPERIOR PERFORMANCE: The A-Series firebox and burner delivery system is designed for high heat, fast cooking requirements of commercial food service operations. These grills feature fast start-up, independently controlled heat zones and lava rock for maximum barbecue flavor. The A-Series firebox is also designed to reduce flare-ups by routing excess grease through the stainless steel burner insert pans, into separate stainless steel drip pans. HIGH COOKING CAPACITY: You can feed everyone at your next party with one of these grills. Big John A-Series Portable Gas Grills are available in 3 sizes. Each size features a large cooking surface, powerful 20,000 Btu burners (two per grill grate) and lava rock to produce instant, intense heat at the flip of a switch. SAFE: A-Series Portable Gas Grills are sturdy, reliable and safe. They are built around a double-wall stainless steel firebox that provides a sanitary, easy cleaning, corrosion resistant body designed to last a lifetime. They also feature a strong tubular steel frame to protect the grill body from damage, wind resistant low-pressure burner tubes and control valves that are recessed into the firebox safe from possible damage. We recommend using our Folding Leg Carts with these portable grills. 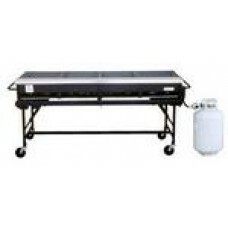 PORTABLE: Our Portable Gas Grills and Folding Leg Carts are popular with rental stores and off-premise caterers. Our compact design makes them easy to store, transport and set-up. They stack for easy storage.